User-friendly features reduce maintenance and improve screening performance. 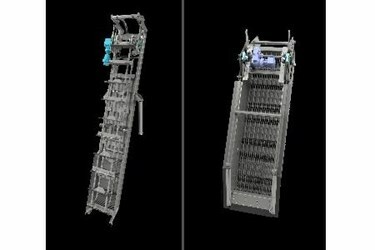 Lauderdale FL (PRWEB) - Parkson Corporation is pleased to announce the roll out of both the Aqua Caiman® Articulating Rake Screen and the Aqua Rhino® Escalating Screen, two new headworks screens which are sure to make an impact on the market. The Aqua Caiman® represents the next generation of articulating rake screen. In designing the screen, Parkson combined over 40 years of experience working on thousands of in-channel screen installations with in-depth market and engineering research. End users can count on true 100% rake engagement with the patent pending True-Engage™ bar fastening design and adjustment without a hoist with the True-Track™ chain positioner. With numerous height variations and installation angles, the Aqua Caiman is designed to fit countless applications. The Aqua Rhino® is the most durable step screen on the market with lifting blades and frame 50% thicker than leading competitors. Its robust design and advanced drive system provide high performance and durability in a cost-efficient package. A direct drive linkage system eliminates weak points commonly associated with other step screens, such as chain stretching and sprocket wear. The screen bottom was designed to minimize space where grit can collect and has an optional spray bar washout system to significantly reduce machine wear due to grit buildup. The Aqua Caiman Articulating Rake Screen and Aqua Rhino Escalating Screen offer low headloss and are suitable for both municipal and industrial applications. Additionally, they can be utilized in conjunction with Parkson’s conveyors or washer compactors to complete the screening system and provide single source responsibility. For additional information on Parkson’s headworks screens, please contact Thomas Steinke at 612-384-7371 or visit http://www.parkson.com/aquacaiman and http://www.parkson.com/aquarhino. Parkson is a supplier of equipment and solutions for potable water, process water, and industrial and municipal wastewater applications. Founded in 1960, Parkson has been owned by Axel Johnson Inc. since 1967. Parkson designs, engineers and assembles products that provide customers with advanced screening, biological, filtration and biosolids management solutions. Parkson also has a highly-trained field service team capable of completely rebuilding aging equipment or retrofitting equipment to include the latest technological advancements.